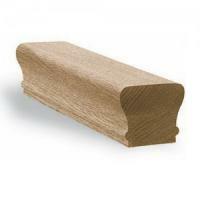 ﻿ Discount stair parts - balusters and newel posts | Scotia Stairs Ltd.
Discount Hardwood Newels Post @ Scotia Stairs Ltd… Buy Direct & Save $$$ Today. ON SALE: Craftsman Square Newel Post – Top Cap & Neck Trim ( 3-1/2 in. Base ) Special We Are Currently Promoting. 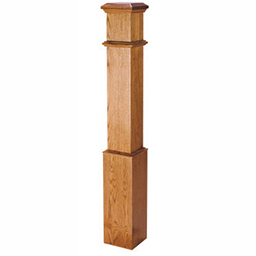 This 3-1/2″ Craftsman Square Newel Post – Top Cap & Neck Trim is our top selling newel post. 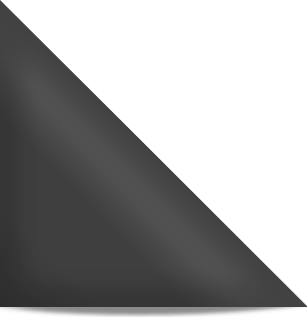 Note: Make this a Box Newel by adding a 5″ base… Add $30.00 To The Above Prices. In Stock Wooden Stair Balusters At Discount Prices From Scotia Stairs Ltd… Buy Direct & Save $$$ Today. ON SALE: 1-1/4″ Craftsman Full Square Balusters In Red Oak, Birch, Maple, and White Pre-finished Are The Current Specials We Are Running. These stair balusters are on the shelf ( in both 36″ & 42″ lengths ) and ready to ship the very next day! Buy Metal Balusters Today At A Discount Of What You Would Pay At Your Local Building Supply Store. 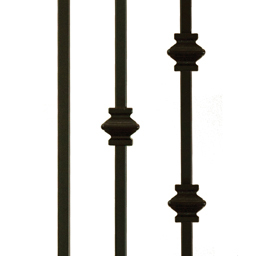 ON SALE: Plain, Single & Double Knuckle Metal Balusters In Satin Black Is The Special We’re Promoting. Our Metal Balusters Are Noted As Being Very High Quality & Are Actually A Trade Marked Product. Discount Hardwood Handrails ( Stair Railings ) @ Scotia Stairs Ltd.
ON SALE: Colonial Handrail Is The Hardwood Handrail Special We Are Currently Promoting. Colonial Railings Are A Beautiful Top Rail For Any Staircase. $6.75 per/ft. – Oak & Birch Solid Canadian Made Colonial Handrail. $8.25 per/ft. – Maple Solid Canadian Made Colonial Handrail. Note 1: Sold By The Foot In Lengths From 4 ft. to 16 ft. Note 2: This Is Solid 2-Ply Candadian Made Handrail.